when a bulk of tech AND trend conscious Koreans on the younger age group were pondering whether to buy the reverable iPhone, another competing coffee shop opened smack in the middle of iTaewon, taking up 2nd & 3rd floors . 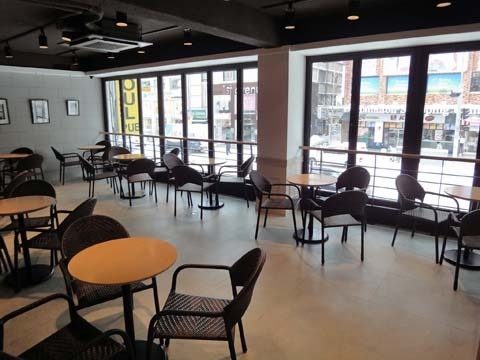 right facing the central Hamilton Hotel AND across Coffee Bean & Tea Leaf cafe (located on the 3rd floor) which was THE place to see AND be seen in iTaewon – OK, NOT counting the restaurants, bars AND clubs . StarBucks has TWO narrower stores few buildings away on /either/ side of this main intersection . 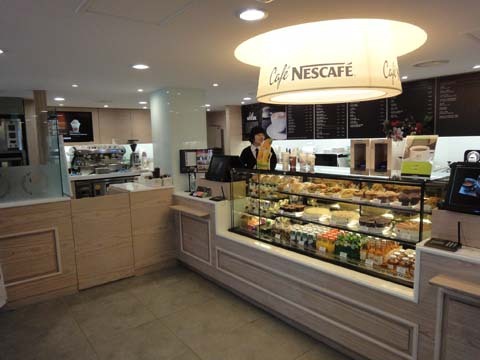 ‘Cafe NesCafe’ started operation in South Korea in December 2000 by DooSan Group Conglomerate through contract with Nestle . and in New Years 2010 – The Year We Make Contact – 40 something stores are open mostly around Metropolitan Seoul (meaning : including surrounding Satellite cities full of apartment rows which in all form the central bulk of KyungGi Region). Seoul Subway Line 6 iTaewon Station Exit 4 /right/ in front !